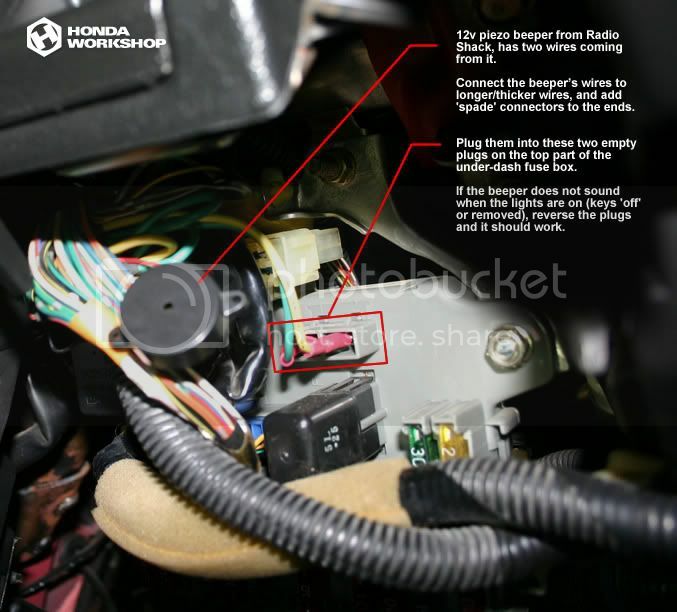 EF Civic and CRX owners are sometimes cought with a dead battery, because the car does not have a built-in warning to let you know if the lights are on when you turn the vehicle off. This is how to plug an inexpensive 12v piezo beeper from any electronics store into the right spot to create a headlight alert. •Radio Shack has a good deal on piezo buzzers or beepers for just a few bucks. The important things to look for are 12v DC capability and a nice tone that is not annoying...look for a curved sinewave on the box as opposed to a square or sawtooth pattern to get a pleasing 'eeeeeeee'. •One foot or so of around 20-gague wire. Speaker wire is fine. AHH SHUT UP!!!! YOU DONT KNOW NOTHING............ABOUT ANYTHING..
Inspiring. I've had the dead battery a couple times because I or my wife left the lights on. I thought the car had a wiring problem with is why the alarm didn't sound with the car off. I bought a piezo buzzer on ebay, we'll see how it sounds. I followed instructions, and when I have lights on but have the car turned off, the buzzer is not sounding. I I turn the key About 2/3 of the way to the "on" position there is a "blip" but when I get to "on" nothing. So, If I turn the key back from on to off, there is a short blip, but that's it. If I hold the key in JUST the right place (again about 2/3 way between insertion of the key and the "on" position) the buzzer will stay on. But I'd rather just check my lights everytime I turn the car off than try to find that sweet spot everytime I turn the key off. I thought this was going to buzz after the car was off, the key removed and the lights on. Not so for me. Tomorrow I'll check it out with a voltmeter to see what's happening at those terminals when the key is on/off. Ha. I forgot about this thread. BUT.... I did get it all put together and thought myself a genius. Then night came and I turned on my lights. BUZZZZZZZZZZZZ!!!!!!!!!!! The buzzer would go off everytime I turned the lights on, whether the car was off or not. So I reached under, and aborted my project. Haven't looked back since. lol. My '91 Civic Si buzzes at me when the headlights are on and the keys are out, does my car have a non-oem modification I was unaware of? Ive fixed your problem. However, youre going to need to have a 5 post dpst Relay, common sense, a bit a of 12v knowledge, etc. Your local automotive parts store or audio shop should have 5 post relays. Once you have the relay, follow the crude diagram i drew up. Black wire on the right side of the relay goes to a ground. the top post will be unused, the middle post will come from the fuse box, and the bottom (verticle) post goes to the buzzer. If i need to, i can come up with a much better diagram and write-up with pictures and such. ill tell you how and why this works real quick. the original problem was that the headlight buzzer would be on ALL them time, even if the car was on. A relay is pretty much an automatic switch. when the car is off, it turns the switch on, which allows voltage to flow through and sound the alarm. when the car is on, the relay turns off, and does not allow voltage to pass through so we dont get that annoying buzz while driving. if youre a 12v technician, please dont bash me for my crude explanation. im just trying to help people understand without going into detail. and like i said, i can creat a more detailed writeup with diagrams, pictures, and better explanations if i need to.